Reward conditioning: Essentially, treat your new puppy like a toddler. When you are around, watch them like a hawk. When you see them grab onto your leather loafers or a chair leg, distract them with some other, more attractive option. When they take the rawhide chew or nylon bone or whatever “good” toy you want them to chew, give them lots of praise, petting, and treats. Absolutely do not try to chase your puppy to get the shoe or bra out of their mouth. That will tell them that it’s all just a big game to you and will encourage them to continue stealing things they know you’ll want to chase them to get back. Even though it is a lot of fun, you must resist! Play chase with good toys instead! 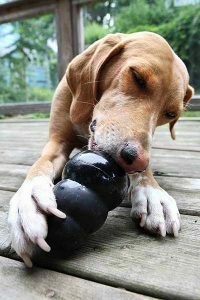 Chew toys: Figure out what kind of chew toys your dog likes and don’t forget to switch them up frequently. Some dogs love cow bones, some antlers, some prefer balls, some prefer stuffed animals, and some prefer ropes! Oftentimes even if the toy is the exact same your puppy will be excited about getting a second, new version of it. And pay attention to how strong of a chewer your puppy or new dog is. You don’t want to buy them toys that they’ll rip to shreds in less than an hour both because it’s a waste of money and not good for them to be eating so much plastic! Chew toys such as hooves are great for dogs, but if they chew them too much then they can get diarrhea (not to mention the smell is horrendous…). 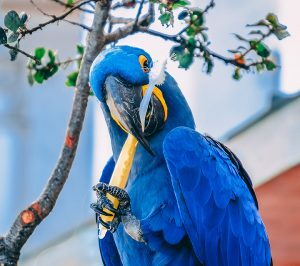 Strong chewers can also tend to whittle away hooves and bones down to such a point that they’re very small and can be easily swallowed. These small fragments aren’t usually digestible and will either lead to vomiting or diarrhea or worse. So make sure to throw them out before they get to that point! Don’t give in, no matter how sad Buster’s puppy eyes are! 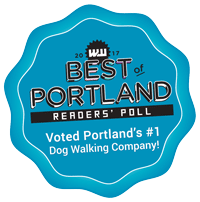 West Paw Design makes EXTREMELY durable dog toys. So durable in fact, that if your dog does manage to destroy them they will replace them for you for free! Besides the Zogoflex line by WPD the only other toys my dog Merry has never managed to destroy are the Chuckit! balls and Kong toys. Crate training: Crate training is the most feasible option for many people, and it can keep your puppy feeling safe and secure when you’re away. This is one of the easiest ways to train a dog to be calm during separation. It takes a lot of practice when you’re home at first, but beyond the reward of an intact couch your dog will also be much happier and calmer when you are away. Working on training with a puppy or any new dog also increases the bond between you two, no matter what you work on. 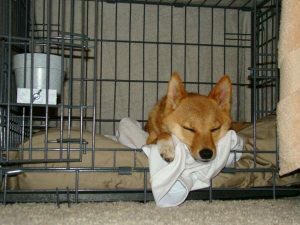 Plus if you ever move crate training is a fantastic way to make your dog comfortable with such a major transition. Preventing chewing: If your puppy tends to chew on a surface that is color safe and won’t be damaged (like your fingers), you can coat the surface in white vinegar or rubbing alcohol. The smell and taste will make the object much less tempting. There are also better smelling alternatives such as Bitter Apple spray. But more than using sprays to discourage chewing you could also use this as an opportunity to puppy-proof your house by being as diligent as possible about cleaning up. Even for adult dogs open trash can be a danger. Make sure trash is kept securely away and it would be best if electric wires such as chargers were also hidden away too. 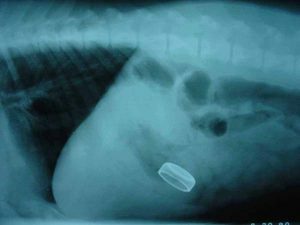 Even if they’re not plugged in they contain metals which may pose a danger to a puppy if they eat them. Cleaning up or using preventative sprays won’t change your puppy’s underlying behavior or your adult dog’s anxiety issues, but it’s a good way to help keep them (and your stuff) safe while you work on training them to chew safer toys or have less separation anxiety. 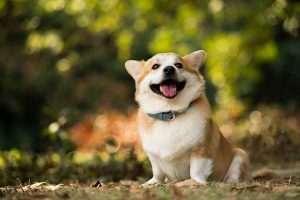 Don’t give up on your puppy: It can be hard to retrain an instinctive behavior like chewing, but it’s well worth it to have a happy, well-adjusted dog, who lives a long life as your best companion!